Althea M. Goodhues, 94, The Pavilion, 705 Fulton St., Sidney, Ohio died at the nursing home on Sunday, November 19, 2006 at 1:50 PM. She was born July 13, 1912 in Baltimore, Maryland the daughter of Daniel and Lenore Bankerd. She moved to Sidney in January of 1999 from Baltimore, Maryland. She was married on June 10, 1930 to Barond Goodhues and he died in 1991. Surviving are one daughter, Elizabeth Johnson of Sidney, Ohio and ten grandchildren and eighteen great-grandchildren. Also surviving is one brother, Daniel Bankerd and his wife Lillian of Baltimore, Maryland and two sister-in-laws, Barbara and Betty Goodhues. Two sons, Barry and Don Goodhues are deceased. 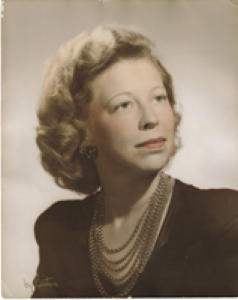 She had previously worked at the Dutch Mill Supper Club as a cook which was owned by her brothers in Baltimore, Maryland and also had been employed as a telephone operator in Baltimore, Maryland. She was an avid shopper and a fan of the Baltimore Orioles Baseball team. She was a member of Holy Angels Catholic Church and a Mass of Christian Burial will be held on Friday, November 24, 2006 at 10:30 AM with Rev. Gerald Bensman. Burial will be at Delany Valley Memorial Gardens, Timonium, Maryland. Friends may call at Salm-McGill and Tangeman Funeral Home on Friday, November 24, 2006 from 9:00 AM until 10:00 AM at the funeral home. Memorial contributions may be made to the American Cancer Society, Southwest Regional Office, 2808 Reading Road, Cincinnati, Ohio 45206.